The Cooper Basin is a sedimentary basin composed of carbonaceous shale and coal and is the most significant on-shore petroleum and natural gas deposit in Australia. Overall, there are 160 gas fields and 75 oil fields with hydrocarbon shows widespread over eight formations. Most of the conventional reservoirs in this basin are tight with low permeability and thus require fracture stimulation to produce the oil and/or gas. 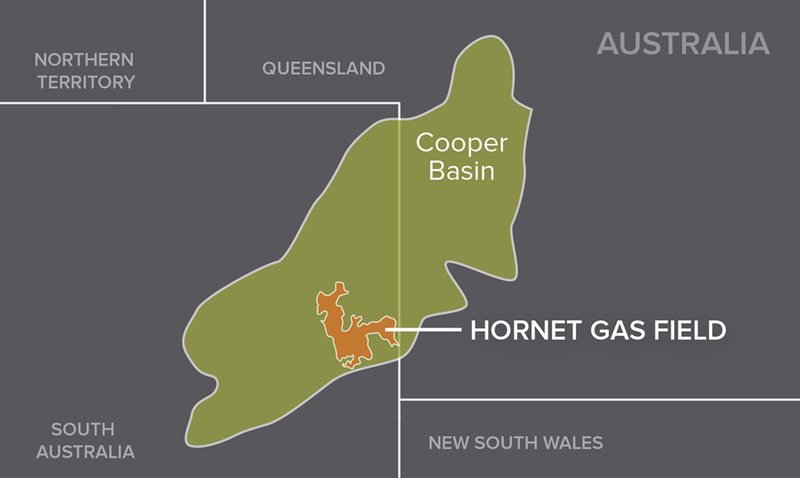 The Hornet-1 well in the Cooper Basin was first drilled in 2004 and intersected gas shows in the Epsilon formation and 28 m of net gas pay in the Patchawarra formation. The operator wanted to fracture stimulate the well using zonal isolation in order to target additional tight gas sands within the Patchawarra formation. As this was a pre-existing well, a workover rig was necessary to prepare the well for fracture stimulation and perforate the zones prior to the fracture equipment arriving on site. Temperatures up to 400ºF (204ºC), fracture gradients as high as 1.4 psi/ft, high fracture closure stresses up to 0.9 psi/ft and a remote location make the Cooper Basin a challenging environment to work in. For the Hornet-1 well, the operator wanted to fracture stimulate six pre-perforated zones over the ~200 m interval from 2,480 m to 2,680 m and required tools that could withstand 350°F (177ºC) and 15,000 psi. With few hydraulic fracturing crews in the country to choose from, exploitation of shale and tight sand gas reserves in Australia is still in its early stages of development. The operator looked towards the field-proven StackFRAC® technology from Packers Plus to solve their completion challenges. For the Hornet-1 well, Packers Plus designed a 3.5-in. 6-stage StackFRAC Titanium® XV high pressure, high temperature (HPHT) system for a 7-in. cased hole vertical well with five Drillable Closeable (DC) FracPORT™ sleeves and one Hydraulic FracPORT sleeve. To ensure that all the design criteria were met, Packers Plus Technical Service Engineers performed detailed pre-job engineering calculations and run requirements. The first stage was opened hydraulically to establish a flow path and communication with the reservoir. The remaining five stages were ball-actuated and hydraulically-activated to allow for the pre-perforated zones of the cased-hole wellbore to be isolated and fractured. External stage isolation was achieved using Titanium XV RockSEAL® packers. The completion of the Hornet-1 well saved the operator significant time and money. All planned objectives were achieved and production from the well was stabilized at 2.2 MMscf/d. This cased, vertical well was so successful it led to the discovery of a new gas field in the Cooper Basin, which from best estimates contains 771 bcf of prospective resource. The operational success of this well reflects the capability of Packers Plus technology and services for challenging completions in the emerging Australian shale and natural gas market.